Foster Parrots is lucky to have an amazing family of volunteers who bring a diversity of skills and experiences to our sanctuary. This summer Colleen DeSimone joined our volunteer force as part of a school project in community engagement, part of her class assignment was to write blog posts about our sanctuary and her experience here. We take pride knowing that our work here is not only to take care of these amazing animals, but also to offer people an opportunity to grow and learn! While I’ve only volunteered at Foster Parrots for a short time, I’ve already become very fond of the beautiful birds that live here. 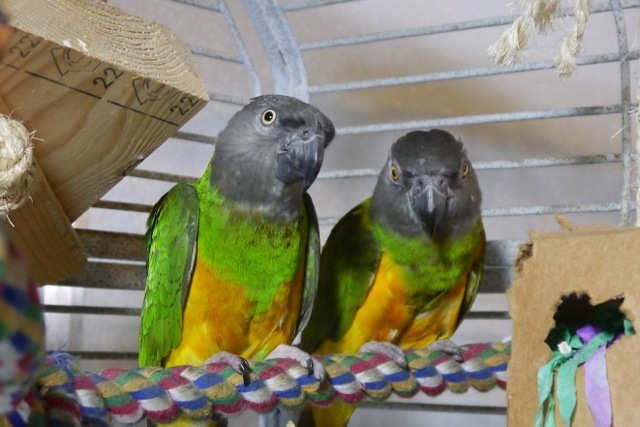 Some of these feathered creatures have been retired here, while others, sadly, have been abused in some way, and have been rescued by Foster Parrots and given a new home where they are loved and nurtured. This is where they come to have their dignity restored. Whatever their previous circumstances, they now reside in large, spotlessly clean cages, each having a distinctive personality that is both endearing and sometimes, a little frightening. Of course, this means they have their bad days from time to time. These birds are intelligent and have some very human characteristics. It is this humaness that I hope to capture and introduce to you in a way that allows you to see them as I do. I’d like you to meet Snowbird. He is one of the retirees here and loves humans and human contact. He’s a gentle, affectionate soul. His movements are deliberate and controlled, and when he turns to look at you, he’s the picture of calm tranquility, and enquiry. “Aren’t you going to scratch, or at the very least, talk to me?” his watchful expression seems to say. I think he’d look perfectly debonair in a top hat and cane! Snowbird has a roommate named Sweet Pea who could be called quite a few things, but sweet is definitely not one of them! He has a particularly angry, mafia-type character, and is only a third of Snowbirds size. He patrols and sits in the front of the cage, waiting for unwary visitors to venture close and mistake him for another sweet soul. Fortunately, not even Sweet Pea seems to phase the gentle Snowbird. 2. Tucker: Huh, who's there?! Aaah, and then there’s young Tucker, an interesting person to be sure. The first time I became aware of him, I was startled and somewhat disconcerted to find him peering down at me, quite calmly, from his perch on the cage above, exactly like he is now. At first I thought it was a joke, like when a hunter has the head of an animal they’ve killed “taxidermied,” and mounted on a wall. Thankfully that wasn’t the case at all, he simply believes that the view is far better outside than it is inside the cage. I think he likes to pop out for a breath of fresh air from time to time, to get away from his roommates and gather his thoughts. Well, whatever it is, it’s very entertaining! 3. Digit: What are you looking at? Last, but certainly not least, is Digit, also a retiree, and a very special bird. His little feet are deformed so he’s unable to hold onto a perch, and so he sits on a soft, warm platform that is easy to balance on. He adores Monica, and is in his element when he gets to sit with her during the day, soaking up all the love and attention she bestows on him. I made the mistake of thinking he was a gentle bundle of feathers, but he also has his feisty side. Apparently, he’s been unwell for some time, and now that he’s feeling better, he’s found his inner Cockatooness, which when directed at me, is loosely sandwiched between a smidgen of aloofness and complete and utter boredom. However, I haven’t given up trying to woo him over to my way of thinking with pistachios and pieces of apple. I know, I know, it is bribery, but he won’t know! Actually, parrots are quite extraordinary in this regard, most of the time they either like you, or they don’t, period. Well, that’s all for this edition, but I’ll be back with more interesting introductions to birds like Sweet Pea/Birdfather, and others. Remembering there is love, even when saying goodbye. Today I had intended to write a blog post glowing about the success of our fantastic Open House last weekend. I had pictures gathered and had already formed a narrative of what I was going to say - proud, happy and excited for the future. But instead now I find myself creatively and emotionally stuck on today and in particular a bird named Tuesday. This afternoon we said a final goodbye to Tuesday, a small and elderly Senegal Parrot. She had a mate named Lurch, was mostly blind and had little interest in people. Unable to live in our feisty Senegal aviary, Tuesday and Lurch had their own cage where they lived together for many years. But tonight Lurch will be alone, a reality that weighs heavy on all of us at the sanctuary. Working in animal rescue, sanctuary or dealing with our own companions - the passing of an animal is inevitable. It is part of our burden as caregivers to watch and help these animals we love so deeply - or animals we barely even know - pass on in peace. Since being at the sanctuary I have been witness to a handful of animals passing away and it is always sad no matter the circumstances. But sometimes their passing touches us differently than we expect. Today my sadness was not just for Tuesday and Lurch, who were at the center of this heartbreaking moment, but my sadness was also for us. For the people who care for these animals. Today I watched 3 amazing and stunningly strong women struggle through the emotional and ethical battlefield of deciding on when and how to intervene on an animal’s inevitable passing. Huddled together in our small medical room, glancing down at Tuesday, then at each other, then back at Tuesday. Each of us shared our own stories trying to remember the “right” way to make this decision. We offered ideas of how we would want it if we were Tuesday, or what we think Lurch would want, or what Tuesday would want in this moment. The conversation circled. And circled again. And again. In the end our veterinarian made the decision for us. No matter how clear the signs might be – this type of decision will never come clearly. To not be able to know for sure what they want or need. Are they thirsty? Are they in pain? To never have an end of life discussion with them, to not have a written and signed Will instructing us on what to do and how to do it. These animals have never had a choice over their own lives. And it almost feels cruel to have to make this choice for them too. But we do. And that is what hit me today while watching my friends and colleagues struggle through the gravity of a decision we have all made before. But no matter how familiar this feeling is, it never gets easier and it never lessens its sting. Without trying to sound overly optimistic, I truly believe working with animals helps us see and experience our own humanity. With all of the heartbreak that can be found in animal rescue just remind yourself this heartbreak is a sometimes a painful reminder that you are human, you are sensitive, you are caring and loving. We are lucky to have this amazing ability to love so deeply any and all creatures - no matter the form. We just need to see the love in these moments, even when it hurts. I cannot thank our staff and volunteers enough for taking care of these animals with such heart and dedication. Goodbye Tuesday – fly free wherever you may be. Once blind, Moluccan cockatoo Mr. Magoo underwent cataract surgery in one eye (thanks to our veterinary team and to “The Crazy Bird Ladies” fundraising group) almost three years ago. His long, slow road to recovery has brought deep joy to staff and volunteers at the sanctuary this year. After surgery, he stayed in a cardboard box in a cage, with his friend Lucy nearby. His cage was moved to different areas in the sanctuary, then he joined a large open aviary and began to live in a series of boxes on the floor with no cage, and five or six other cockatoos nearby. Then early this December he ventured away from the safety of his box, climbed up the side of a cage, and made his way out on to a play frame. Volunteers and staff alike marveled at his new-found courage, visiting the North Park aviaries to witness what once seemed impossible. He still lunges and postures when a human comes near, but he is now well on his way to a life of independence. Well done, Magoo—what a happy way to end 2015! Read Mr. Magoo’s history here, and please consider supporting Foster Parrots to help all our birds achieve lives of individuality and peace. Yesterday our animal caregiver Joanne noticed that Zilla, our resident iguana, appeared agitated in her enclosure. Immediately we knew there was something wrong, as we watched our normally slow moving Zilla pace back and forth and up and down in her enclosure trying to find a comfortable place to stop and rest. So off to Dr. Hank's she went! It was a nasty drive in the dark and the rain, with a sick iguana in a carrier in my back seat. But as many of you know, when an animal is not feeling well time is of the essence. We rescued Zilla back in 2013 from the all to often typical life in a fish tank that many iguanas live. Over the past year and a half we have enjoyed watching Zilla grow in size and into a truly stunning animal. We are incredibly lucky to work with Dr. Hank Wietsma, who is not only an avian expert but also specializes in exotics. Here is Dr. Hank Wietsma (Right) and Dr. Sam Lester examining Zilla and giving me a crash course in iguana anatomy! Dr. Wietsma explained that the small line of pores on the inside of her leg indicate that she is female and that if she were male these pores would be larger and more noticeable. Zilla shows off her healthy pink mouth. While the tail is often the scary power part of an iguana, this mouth apparently can do a heck of a lot of damage too! Upon examination Dr. Wietsma recommended we do blood work and x-rays to get a better idea of what is going on with our sweet (and at this point mildly frustrated) Zilla. As we all hoped - "little" Zilla is perfectly healthy! But is full of eggs and looking to nest. Dr. Wietsma explained that the scalloping you can see in the x-ray (by the white arrow) are a cluster of developing eggs. Now it is important that we watch her eating habits and weight as we wait for her to pass the eggs. Just like parrots, iguanas can also become egg bound, a life threatening condition when an animal is unable to pass developed eggs which can require emergency surgery to correct. We have created quite and warm nesting areas for her in her enclosure that will hopefully encourage her to lay these eggs soon. Thank you to all the technicians and staff at Coventry Animal Hospital who go above and beyond to help take care of our animals - both feathered and scaly. I will keep you posted on how things go with Zilla. Its never a dull moment here at the sanctuary! I love this video and felt the need to share it tonight. Just a simple reminder of why we do what we do. More posts to come this week I promise - lots of stuff happening at the sanctuary these days. So much so its hard to find the time to write a decent blog post! Please keep checking back in, I promise I will have some fun sanctuary pictures and news up soon. Its about 9:30 at night and I finally got the green light that our hosting network has redirected our domain name to our new address. Whew! Our site is officially live and I couldn't be happier! I hope you enjoy the new design and will check back in on our blog regularly. Today's first post is going to be a short one, since I am deliriously tired and need to pull my eyes away from the computer. I will be back in the morning with proper hello and introduction to our blog.